Below we highlight the best and worst performing US equities so far this year. As shown, most of the winners fall under the "Micro-Cap" category, with WLT and MMR being the only gainers with over $1b in capitalization. 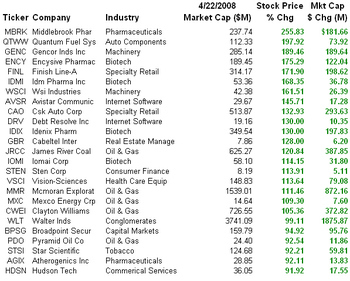 The losers include several former billion dollar companies, ABK and FMD probably the most notable. MBRK, MiddleBrook Biopharmaceuticals, headquartered in Germantown, MD has been the best performing US stock this year, up 255%. KERX, Keryx Pharmaceuticals, headquartered in New York, NY has been the worst performing US stock, down 94.5% year to date. Yes, this is a nice site. I like it so much. That is really the worst stock performance ever. I can still remember those days. It is like a nightmare. I wish that it will stop from happening.